When Liberian high school student George Toddy failed the math and science sections of his college entrance exam, he was disappointed but not surprised - he had heard that his region had a very high failure rate compared to other parts of the country. After attending an awareness raising activity held by The Carter Center to discuss Liberia's freedom of information law, he began to wonder: Why did students in the southwest do so much worse in the exam than those elsewhere, and why were the low scores always in the math and science sections? "I needed to figure out why this was happening. I wanted a fair chance to go to college like anyone else in my country," said Toddy. With his newfound awareness of the law, he made a freedom of information request to his school and to the local department of education to obtain a copy of the math and science curriculum. He compared the national curriculum to the classes he had received and found that his teachers had been skipping a number of the requisite classes. That was why he and many of his friends were not able to pass the national exams. Toddy contacted his school and the district education office to let them know of this discrepancy. Since then, new procedures have been put in place to monitor the actual classes taught to ensure consistency with the national curriculum. George also helped launch a freedom of information club at his school so more students could learn about and use this great resource. 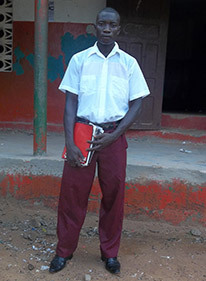 Because of George and his freedom of information request, future students in the southwest region now have a greater chance to pass college entrance exams and enter university the same as anyone else in Liberia. The Carter Center has partnered with Liberian civil society since 2009 to raise awareness of the country's freedom of information law and its ability to transform lives.